Also referred to as "Purple bacteria and relatives", Proteobacteria makes up one of the largest phyla and most versatile phyla in the Bacteria domain. As such, it consists of several types of bacterial that include phototrophs, chemolithotrophs and heterotrophs. Today, well over 460 genera and 1600 species of the phylum have been identified. While some are free living, others are pathogenic (plants, animal and human pathogens) and cause a range of diseases. * The name Proteobacteria was derived from the ancient Greek god of the sea (Proteus) who was capable of assuming different shapes. Currently, this diverse species are grouped into 6 major phylogenetic groups/classes. Alphaproteobacteria is the first class and is composed of a variety of bacteria. This includes bacteria of different shapes (rod, spiral, coccobacilli and curved rods etc) as well as differences in metabolism etc. Despite their differences, Alphaproteobacteria are unified by the fact that they are all oligotrophs. As such, they can survive in environments with low nutrients including glacial ice. This allows them to survive and thrive. A majority of Alphaproteobacteria are phototrophic which means that they obtain thier energy from sunlight (use sunlight and carbon dioxide to make their own food) due to the presence of photosynthetic pigments. For the most part, the phototrophic Alphaproteobacteria (purple) have been shown to grow under anoxic conditions where they make their own food in the presence of very little to no oxygen. Apart from the phototrophic genera in Alphaproteobacteria, this class is also composed of CI-compounds metabolizing bacteria like Methylobacteria species, plant symbionts like Rhizobium species, Nitrifying bacteria like Nitrobacter and animal and human pathogens (Brucella and Arlichia etc). This class of proteobacteria is therefore composed of a wide variety of species. Whereas some are beneficial to human beings and the environments in general, others are pathogenic and thus cause diseases in human beings and animals. However, some are free living and do not need a host for thier survival. Compared to Alphaproteobacteria, Betaproteobacteria have been shown to require larger amounts of nutrition given that they are eutrophs. 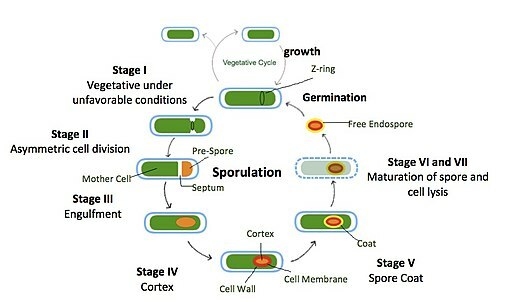 This Gram-negative class is also composed of aerobic and facultative bacteria (some grow in oxygen rich environments while others do not require oxygen for thier survival). Whereas the class Betaproteusbacteria is composed of many chemolithotrophic genera such as Nitrosomonas that oxidize ammonia, it is also composed of various phototrophs and pathogens. Good examples of pathogenic species include the Neisseriaceae bacteria and the genus Burkholderia. Whereas Neisseriaceae bacteria are responsible for such diseases as gonorrhea and meningitis, members of genus Burkholderia have been associated with such diseases as glanders in horses and other pulmonary infections. 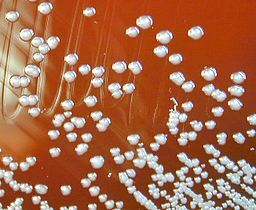 Burkholderia pseudomallei colonies on a Blood agar plate from the CDC Public Health Image Library. credit: CDC/Courtesy of Larry Stauffer, Oregon State Public Health Laboratory (PHIL #1926), 2002. The class Gammaproteobacteria is one of the largest groups in the bacteria domain. As such, it has been shown to have a large branching phylogenetic tree, which is also one of its distinguishing characteristic. To date, no biochemical trait has been shown to be unique to this class or any of its subgroups. Despite the diversity that has also been identified in the metabolic activities of Gammaproteobacteria, a majority of the bacteria are chemo-organotrophs that obtain their energy by oxidizing the chemical bonds of various organic compounds. Apart from chemo-organotrophs, the class is also composed of phototrophs (obtain energy from sunlight) and chemolithotrophs that obtain their metabolic energy from the oxidation of hydrogen and sulfur among others. Enteric bacteria also make up this class and include organisms like Escherichia coli. These organisms cause diseases in animal and human beings. Deltaproteobacteria is a smaller branch that is largely composed of aerobic genera. Most of these organisms are fruiting body forming that tends to release myxospores when conditions become increasingly unfavorable. The strictly anaerobic genera in this class contain sulfate and sulfur- reducing bacteria. Deltaproteobacteria also consists of a few pathogenic bacteria like SRB Desulfovibrio orale and Bdellovibrio bacteria that live in other gram-negative bacteria as parasites. In the host bacteria, Bdellovibrio bacteria position themselves in the periplasm where they actively feed on proteins and pollysaccharides. This ultimately kills the host bacteria. Epsilonproteobacteria makes up the smallest class proteobacteria. As such, it is made up of a few genera that are known as microaerophillic bacteria. These are a type of bacteria that require very little levels of oxygen to survive. Some of the most common Epsilonproteobacteria include species of spirilloid Wolinella, Campylobacter species as well as Helicobacter species. Campylobacter bacteria and Helicobacter have been associated with a number of diseases that affect human beings and thus make up clinically relevant genera. For instance, whereas Campylobacter bacteria like C. jejuni have been associated with food poisoning that causes severe enteritis in human beings, flagellated bacterium H. Pylori (a member of Helicobacter) have been associated with stomach microbiota and chronic gastritis. * For chemolithotrophic epsilonproteobacteria such as those found in hydrothermal vents and cold seep habitats, energy needs are met by reducing/oxidation of chemical compounds. Zetaproteobacteria is the sixth and most recent class of proteobacteria. A majority of bacteria in this class are found in hydrothermal systems (submarine volcano etc) where they have been shown to contribute to biogeochemical cycling of iron. Most of the bacteria found in this class are chemolithoautotroph given that they obtain their energy by oxidizing chemical compounds. Ghiorsea bivora is one of the most popular members of Zetaproteobacteria. As mentioned, there are different types of proteobacteria that are classified under six major classes. Within these classes, there are also different types of bacteria that are distinguished by their metabolism mechanisms, shape and habitat etc. With regards to habitat, this species can be found in a wide range of environments depending on their energy sources and metabolism mechanism. For instance, by looking at members of Alphaproteobacteria, it is possible to identify a wide range of organisms that can be found in different habitats ranging from plant roots (Rhizobium and Azospirillum) inside the cells of a host (rickettsias) and as free living bacteria in the environment such as Methylobacteriaum species. Being one of the largest and most versatile phyla, therefore, proteobacteria can be found in virtually any environment across the globe. This is made possible by the fact that some of the species in the phyla can survive extreme environments with very little to no oxygen. Because of their diversity, Proteobacteria have been shown to make up well over 40 percent of all prokaryotic genera of the Gram-negative bacteria. As prokaryotes, they lack a membrane bound nucleus present in eukaryotes. In addition, they also lack a membrane bound mitochondria and any other membrane bound organelle, which means that most of thier organelles are not covered by a membrane. Because of their diversity, they are also characterized by high morphological and physiological diversity and are composed of rod, cocci and ring shaped bacteria etc. Morphological characteristics of these organisms play an important role given that it can influence survival in thier environments. In aquatic environments, filamentous proteobacteria can move easily from one area to another and therefore to favorable environments. While proteobacteria species can be found in an array of environments, a majority of these species are mesophilic, which means that they prefer moderate temperatures (20-45 degrees Celsius) to grow and thrive. Some have been shown to be thermophilic (such as tepidomonas and thermosulfata that can survive high temperatures) and psychrophilic/cryophiles that are capable of surviving in extremely low temperatures (e.g. Polatomonas). For a majority of proteobacteria species, motility is made possible by the presence of polar/peritrichous flagella. As a result, a majority of these organisms are motile and can therefore move from one location to another within thier environments. 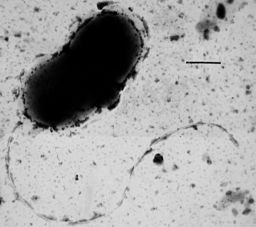 For such myxobacteria that belong to the Deltaproteobacteria, motility is through gliding. For such bacteria, research studies has also identified highly complex developmental lifestyles as is evident with multicellular structures known as fruiting bodies. As already mentioned, some members of Proteobacteria need a host to survive; while some will form a symbiotic relationship with plants and benefit each other, whereas others exist as parasites and thus carry diseases or harm the host. Apart from the different diseases to plants and animals, the phyla is composed of various well known human pathogens that are responsible for intestinal and extra-intestinal diseases. In human gut, interaction between microbiota and the cells plays an important role in digestion. However, it also helps shape and modulate the immune system. In cases of increased disease (gut) Proteobacteria are often found to have increased in number, which is evidence of instability of microbiota. Bacteria species belonging to the class Betaproteobacteria. Gammaproteobacteria (V. cholerae and Enterobacteriaceae etc) and Epsilonproteobacteria (C. jejuni etc) have been associated with a variety of intestinal diseases and inflammation and are therefore of great clinical significance. In addition, these organisms have been associated with such conditions as inflammatory bowel disease (IBD), Crohn's disease (CD) as well as ulcerative colitis (UC) which are chronic infections that are often associated with persistent inflammation of the intestine. All proteobacteria are Gram-negative. As such, they do not retain the crystal violet stain (primary stain) during gram staining. This is due to the fact that, like many other gram-negative bacteria, they have a thin peptidoglycan layer that allows gram-positive bacteria to retain the stain. See Cell Staining for more info. * When viewed under the microscope, E. coli cells will appear pink in color. This is because the cells release the primary stain following decolonization. The pink color is a result of the secondary stain (safranin) that is retained (because it is not decolonized). While some members of Proteobacteria are pathogenic and thus carry disease to the host, some are free living and do not need a host for their survival. There are a variety that present many benefits in their environment. A good example of these bacteria are Nitrogen-fixing bacteria (e.g. Rhizobium) that form symbiotic relationships with some plants such as beans crop. Here, the bacteria convert atmospheric nitrogen into a form that the plants can use (ammonia). This presents a benefit for the crops and contributes to their growth. Radhey s. Gupta. The phylogeny of proteobacteria: Relationships to other eubacterial phyla and eukaryotes. 2000. Beile Gao, Ritu Mohan and Radhey S. Gupta. Phylogenomics and protein signatures elucidating the evolutionary relationships among the Gammaproteobacteria. International Journal of Systematic and Evolutionary Microbiology (2009), 59, 234–247. Stanley Falkow, Eugene Rosenberg, Karl-Heinz Schleifer, and Erko Stackebrandt. The Prokaryotes: Vol. 5: Proteobacteria: Alpha and Beta Subclasses.